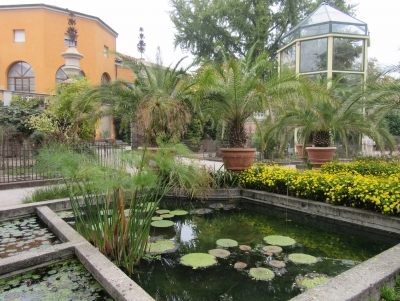 The Orto Botanico of Padua is the oldest Botanical Garden in the world that has been in continuous use. It was established in 1545 by the University of Padua (and designed by Daniele Barbaro), and has been a great influence on other botanical gardens around the world. The garden at first was geared to the growth of medicinal plants. 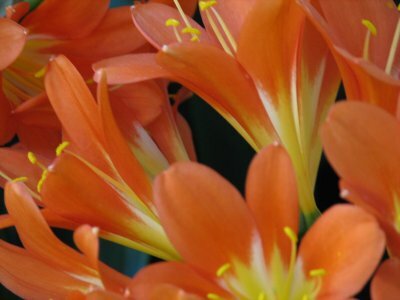 Over the years it was enriched with plants from all over the world, brought in by the Venetian Empire. 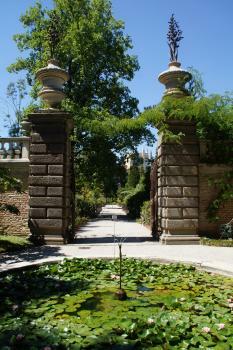 Later additions are the greenhouses, the four wrought-iron gates, an arboretum and an English garden. 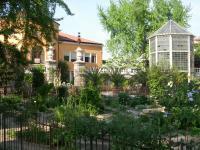 The Orto Botanico is also home to an impressive scientific library of more than 50.000 volumes. 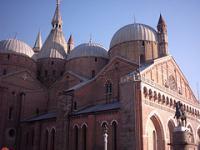 I visited Padua on the same day as Vicenza. They’re only about an half hour apart by train, but you’ll have to make an early start and plan your trip well. I had pre-booked a visit to Padua’s most renowned sight, the Cappella degli Scrovegni (on Italy’s Tentative List), but arrived way too late to make the allocated time-slot. So I just walked on to the Botanical Garden. It is located on the other side of town from the railway station. The station area is rather scruffy, and the center of town also lacks atmosphere. The Garden however is a real oasis, pleasing to the senses and to my feet where all the walking was taking its toll. After paying a 4 EUR entrance fee you’re free to drop down on one of the benches in the garden. There were quite a number of other visitors around, even a bored-looking Belgian school class. After giving my feet a rest, I roamed around the garden for an hour or so, trying to capture the few blossoming flowers on camera. The oldest plant around is the so-called Goethe palm, which dates from 1585. It was visited by Goethe in 1786, who got inspired by it to write about evolution. The palm nowadays is covered by a glass house. The area is quite small, and the idea that everything has been here for such a long time is more interesting than the site itself. The nearby Basilica del Santo is worth a look when you've visited the garden. I visited the botanical gardens in late September 2018 on a warm and sunny day. Having seen a lot of old towns and churches recently, these gardens came as a lovely surprise. Not being particularly interested in gardens or gardening, I was not greatly enthused by the thought of this visit, however I thoroughly enjoyed the 2 hours I spent here. The garden is in two parts, the old, historical garden and a new garden contained within a large metal and glass building. The two could not be more different, but both were equally enjoyable, focusing on different aspects of our interactions with plants over time. The old garden was not at its best at this time of year, and I felt that it was a little untidy and unloved in places. The sense of history was palpable though, and it was fascinating to understand the role of the garden in influencing other botanical gardens and botanical studies around the world. The new garden had a similar feel to the Eden Project in Cornwall, UK, in that it housed plants from different climates, such as Arid, Temperate, Rainforest etc. The focus here though was more on human's relationship with plants, through history, and into the future. It was actually very interesting. The cost, which includes both gardens is EUR 10 per adult. The gardens are located to the south of the city, just past the incredible St Anthony's Basilica, and about a 25 minute walk from the station. I enjoy a good botanical garden when traveling, so I looked forward to visiting the Botanical Garden in Padua last year, even though I knew I would be visiting out of season. The Orto Botanico was constructed almost five hundred years ago, and started a tradition of botanical research that can be seen in gardens worldwide. Considering its age, I set my expectations appropriately low enough, since there are many other gardens that cover more ground or feature a wider variety of plants from different climatic zones. The heritage section of the garden is laid out in a simple pattern, with a mixture of historic trees, medicinal and rare plants, and aquatic gardens on display. The garden is small enough that it didn't take long to traverse. Some of the plants were still in bloom, and some of the trees still had fruit in October; still, the cool breeze was a reminder winter was on its way. I think I'd like to return sometime in the spring or summer to see the garden when more plants are in bloom. Of note, there is a newer indoor botanical garden featuring plants from a variety of climates that you can visit on the same admission ticket. I still enjoyed the heritage garden more. Logistics: The Botanical Garden of Padua is located south of the city center of Padua, and is a short walk south from the square in front of the Basilica of Saint Anthony. 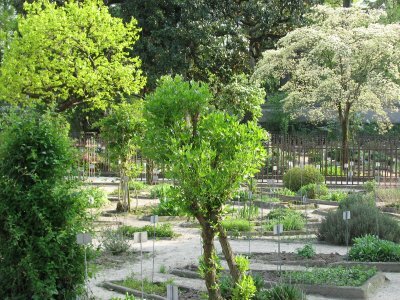 Certainly, the Orto Botanico is not a highlight among the World Heritage sites in Italy and even in Padua, the site is by far less popular with visitors than the famous Scrovegni Chapel or the Basilica of Saint Anthony. I had visited the garden for the first time in 2004 and re-visited it on a weekend trip in August 2016. The memories of my first visit were not particularly good, at that time large parts of the garden were not well-kept and many plant beds were empty. But obviously, things have changed and today the garden is in very good condition. 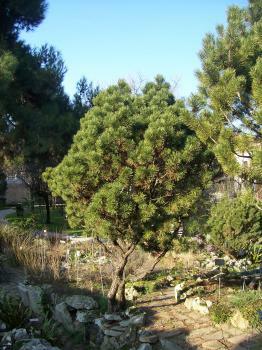 It is relatively small in size compared to other botanical gardens, but there is a great variety of species, a leaflet highlights the oldest and most important plants: an Oriental palm tree with a hollow trunk, a Gingko tree from the 18th century, a Magnolia from the 17th century, or the oldest tree the so-called "Goethe palm", planted in 1585. I found the collection of poisonous plant interesting, labels indicate their hazard level. The reason for inscription was that the Orto Botanico was the first academic botanical garden and that it still has the original layout: a square in a circle, symmetrically divided by two intersecting paths. The circular perimeter wall, the fountains and the four iron gates have also been preserved. Another thing that has changed since my first visit is the entrance fee, it was 10 euros in 2016. But this is justifiable because the entrance to the modern greenhouse, the Biodiversity Garden, is also included. We spent about two hours for both, the historical and the modern part. We enjoyed our stroll in the shadow of the old trees and a rest on a park bench, it was a relaxing break from our tour to the Trecento artworks listed in the TWHS entry, which were the focus of our trip to Padua. I visit this WHS in September 2008. Padua is a great city that is home to St. Anthony's Basilica, the Astronomical Clock and Italy's largest square, Prato della Valle. The Orto Botanico of Padua is the world's first botanical garden, it is an important site for scientific research, however I think it would be fair to include the historic centre of Padua with this inscription as it really deserves world heritage recognition and protection. Having looked at aerial maps of the site and knowing I would be visiting in winter I set my expectations low. However I did enjoy my visit but I don’t think it will be a highlight of most people’s time in north-eastern Italy. The main factor for its inscription is the fact that it is the oldest existent botanical garden in the world, and the fact that it is still laid out to these original plans. It also houses a large collection of materials and data for cataloguing plants. Worthy I guess of being a world heritage site. What can you expect; essentially a well laid out small park with the names of all the plants in Latin and a few water features, and if like me you visit in winter there will be some very bare looking plants. It certainly didn’t set my world alight, but the staff were friendly and there was a relaxing, out of the way ambiance. Padua was a nice city, the centre was littered with impressive buildings and the Prato della Valle near the gardens was impressive. However Padua did house the absolute stand out sight in the north of Italy in the shape of the Scrovegni chapel which will make a truly world class WHS if it ever gets nominated from the tentative list, shame you missed it Els. Not the greatest WHS but probably a worthy one due to it’s age and continuity, however if you are in Padua there is a truely world clas site to visit in the shape of the Scrovegni chapel. I presently visited the Orto Botanico di Padova, the original of all botanical gardens throughout the world and I was appalled by this place. The leading role in the introduction and study of many exotic plants was difficult to detect and the museum is farcical. Even if the garden is notable for its age it is not in a really good condition when you are focussing on plants and not on historical design. There is no reason to bewail the size of the squares where plants are allowed to grow because of the size of the garden. But there are no excuses for that concussive way of presenting plants - in any botanical garden. Many of the herbaceous plants were undernourished or even absent (please have a look on the photograph). I commendatory can say that every square has its nameplate but it really shocked me to discover for example missing Thyme which is very robust genus and able to cope with fierce conditions. In my eyes it is also questionable whether strawberry can be seen as a poisonous plant. Maybe the classification into that category portends that the leaves can be pharmaceutical useful but classifying Fragaria vesca as poisonous is incorrect. Anybody might explain this decision to me. For me the visit in the Orto Botanico was a degrading event which really upset me a fortiori if you see this garden from an angle of an UNESCO World Heritage Site. It might represent the birth of science and scientific exchanges but I was not able to find the conception for establish understanding of the relationship between nature and culture - unless plants are not in important anymore and the garden can be seen as a sign for the progress in technology and there is no need to waste time and manpower. I have visited once the Botanical Garden of Padua, founded in 1545 by the University under the project of Andrea Moroni and of the humanist Daniele Barbaro, originally for containing 1500 plants, useful for the pharmacy, as the first botanical garden in the world. The 22000 sq. m. of its irregularly shaped area, originally enclosed by a high brick wall, represent the world surrounded by the ocean (Alicorno canal) and contain a closed circular garden 86 m in diameter, which enclosed a 41 m square plot; the entire garden is divided in four quadrants by pathways at right-angles to one another, running to the four cardinal points. Since the foundation of the garden, with many later additions, the four smaller squares created by the two pathways cutting the central square, are decorated with geometric flower beds, bordered with stone, in each of which is a plant specie. In 1704, when the four entrances were modified, the wrought iron gates giving to the inner circles and the four acroteria were placed on the eight pillars and surmounted by four pairs of wrought iron plants. In this period were also build two fountains, made of Istrian stone, outside the circular garden, and the nice balustrade, that runs for 250 m on the circular wall. 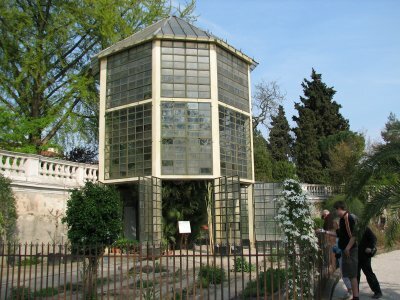 Some of the greenhouses made of heated stone, that replaced the mobile conservatories, used for protecting delicate plants in the winter, retain the original heating system and the pumping installations. The library contains 50000 volumes and 1500 portraits and pictures of the botanists and the herbarium, the second biggest in Italy, contains 416500 dried specimen. 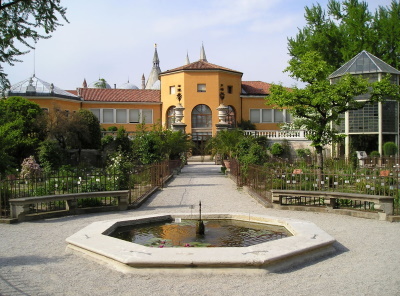 The Garden collected rare plants, that were later introduced into the rest of Europe and there are some of the oldest European specimens; a plant was also studied by Goethe during his visit in Italy. The 6000 exemplars are arranged with systematic and utilitarian or ecological-environmental criteria or in thematic or single collections. I was a little bit disappointed by the garden because I thought that it is bigger, even if it is interesting. It's worth to be visited if you are in Padua and however justifies the inscription, even if it could be inscribed with the complex of the Square of St. Antonius , with its stunning basilica and school, Gattamelata's Monument amd Oratory of St. George, and of the square Prato della Valle with the Basilica of St. Giustina; also the Scrovegni Chapel, currently on the Tentative list, can be inscribed as a separated monument. The Orto Botanico is yet another gem in the already amazing town of Padova. The garden itself is quite small, but it is notable for its age (founded in 1545) and its contribution to botany and agriculture in Italy. Hundreds of varieties of plants are on display in the circular grounds of the garden in the shadow of the imposing Basilica of St. Anthony, and the entrance fee for students is only 1 euro. Once you've explored the garden, don't miss the Basilica, the impressive Duomo and Baptistry, the truly stunning Cappella degli Scrovegni (with frescoes by Giotto), or any of the other numerous hidden treasures that Padova has to offer.